So, since I claim that I am the “Chief Nudger,” I figure I should be an example of trying out new things. In the spirit of personal growth, a friend and I decided to try out for the spokesduck opening at Aflac in March. If you hadn’t heard, the prior spokesduck made some rude comments and was fired. So, though we have no voice talent, and have never tried this type of thing before, we knew our chances were slim, but hey…you can’t win if you don’t try, right? 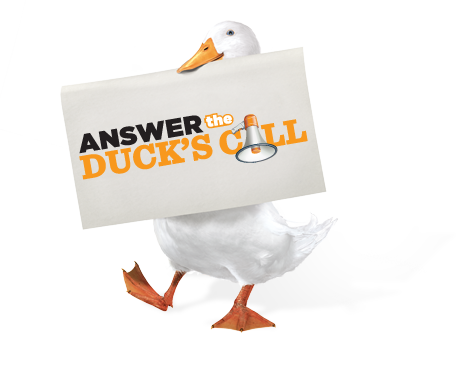 Here’s a link to the contest – http://www.quackaflac.com/. Do you want to hear what I sent in to the contest? We’ll upload it once we find the best place to upload the file – since this site doesn’t allow it and it had a “failure” message when I tried to upload it to YouTube. They gave us tips on different sounds to make (excited, sad, frightened, etc.) – just in case you thought it was a bit strange. We had 30 seconds to provide different voices. It isn’t as hard as it looks. I need to find a good site to upload audio only – besides iTunes. I can laugh at myself and share the story with others – spread the joy of making and learning from mistakes. Can’t wait to hear the new Aflac voice! It better be good!